An unusually large mantid explains the finer points of courtship to me. Last summer during the visit of the periodical cicadas a reporter asked if the female cicada got to “eat the head off the male after they mated”. I said that this curious behavior was employed by only a few of our most colorful insects such as the praying mantid. By chance, I bumped into a rather large female mantid in my back yard the other night. After convincing her not to eat my head, I told her I was not her species, I posed the “head-eating” question to her. She said that dinner and a date were always fun for a girl but most guy mantids were, well, just a little short in the brain department. She assured me that the guy was not always on the menu but by eating the head of a suitor either during or after mating, a girl could get a high quality meal to help nurture the eggs developing in her ovaries – dinner and a date. She also explained that sometimes the guys were a bit shy over the whole mating business. What better way to eliminate the source of these fears then simply removing the timid one's head? In the mantid's world some tasks, including mating, can be successfully accomplished without much thought, in this case even without a head. All well for the girl but what's in it for the guy? To paraphrase the philosopher, Meat Loaf, these mantid guys will “do anything for love”. It seems that by making the ultimate sacrifice, the proud and sometimes dead suitor ensures that his genes are passed along and his embryos have plenty of nourishment as they develop in the womb of his bride. I bade the mantid good hunting and adieu. Young mantids eat small insects such as aphids and flies. The Chinese mantid is just one of several species that occur in North America. Chinese mantids were imported in the 1800's to help control pests of agricultural crops. The success of this introduction is questionable. Chinese mantids are sometimes considered invasive because of their tendency to capture and eat large and beneficial native species including pollinators such as bees, butterflies, and beetles. Notice the swollen adomen on our pregnant pet mantid, Manti. Large Chinese mantids have been reported to capture humming birds and the pet mantid in our laboratory, Manti, was captured after fending off an adult male cardinal. The bird caught Manti, then dropped her, and flew away. A close inspection revealed that Manti had a red feather wedged in the sharp spines of her raptorial foreleg. She proceeded to eat the feather and groom herself. As a youth, Manti ate small insects such as aphids, spiders, and flies. As she grew, she captured and ate ever-larger prey. As you can see from her enlarged abdomen, Manti is now loaded with eggs. In colder locations mantid eggs survive the winter in an egg case called an ootheca. Her eggs will be deposited in a foamy egg mass called an ootheca that is usually attached to a branch or stem. Here hundreds of eggs will spend the winter awaiting the warmth of next spring to hatch. Contrary to popular belief, Chinese mantids are not endangered or protected by special mantid laws. They are easy to collect and make fantastic pets. They are “sit and wait” predators. Their green coloration allows them to blend well with foliage. Mantids have excellent eyesight and when an unsuspecting bee or butterfly happens by, they extend their grasping forelegs and impale the prey with stout spines. The victim is then consumed alive, quite gruesome really. 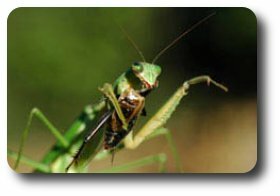 To learn more about mantids visit the following web sites.